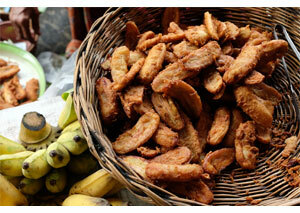 Improved flexibility and increased photo opportunities. 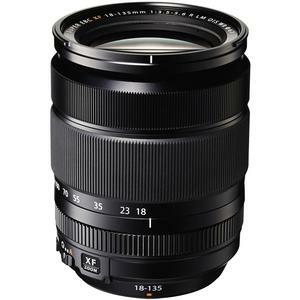 The Fujinon high-magnification zoom lens, 18-135mm f/3.5-5.6 XF R LM OIS WR, covers a wide range of shooting scenarios, from wide angle (27mm equivalent) to telephoto (206mm equivalent). This lens boasts the world's most advanced 5.0-stop image stabilization technology and a dust-proof structure with weather resistant sealing applied to more than 20 different areas of the lens. It has high-performance glass that includes 4 aspherical and 2 ED lenses with multi-layer HT-EBC that effectively reduces lens flare and ghosting. 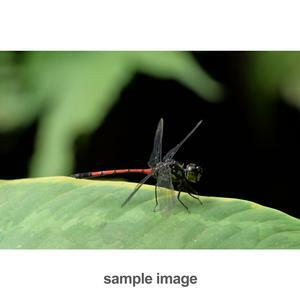 It offers rapid auto focus speeds (max. 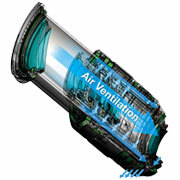 0.10 seconds) and silent operation thanks to the low noise linear motor technology. In order to realize the world's most advanced 5.0-stop image stabilization performance, movement detection in the low-frequency band was improved and an algorithm to accurately sense blur from the detected signal was developed. 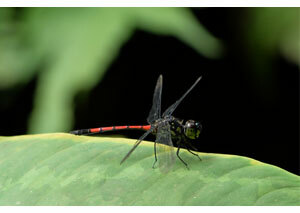 This improves correction performance by 2 times in the low-speed shutter range. The ability to take handheld shots and photos without a tripod makes this lens even more versatile. The newly adopted high-precision gyro sensor features quartz oscillators which detect movement from high frequency to low frequency bandwidth resulting in 5.0 stop image stabilization. 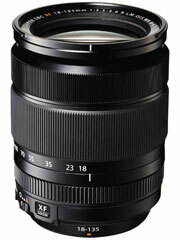 This zoom lens can be used for many subjects in various shooting scenes as it covers popular angles of view. 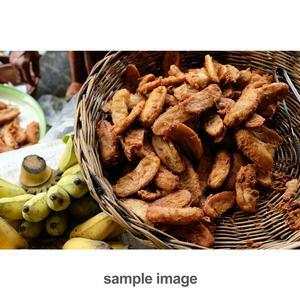 These include wide angle, often used for shooting landscapes and architecture with an excellent sense of perspective (27mm), a normal angle of view that naturally captures the image as is (35mm, 40mm, 50mm), and telephoto which typically magnifies portraits and sports scenes (85mm, 135mm, 200mm) with its 7.5x zoom. The high descriptive performance, with sharpness and rich contrast from wide angle to telephoto, is achieved through high-performance glass including 4 aspherical and 2 ED glass lenses. HT-EBC multi-layer coating, which has high permeability (99.8%) and low reflectance (0.2%), is applied to the entire lens to reduce lens flare and ghosting which often occur in backlight conditions. When using the wide zoom range of the lens, there is more freedom in composition and angle selection. 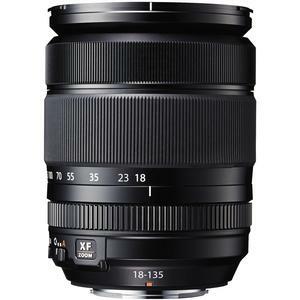 The 18-135mm f/3.5-5.6 XF R LM OIS WR Zoom Lens uses an inner focus mechanism for rapid autofocus speeds. This was achieved by making the focus lens lighter and installing a linear motor. This technology directly drives the focus lens and creates less noise for silent operation, especially valuable when shooting movies. By combining this lens with an X-series camera body that is compatible with phase detection AF, you can enjoy faster, smoother operation. The weather resistant structure, with applied sealing on over 20 areas of the lens barrel, is protected from various changes that occur in a natural environment, such as sudden rain, dust and humidity. 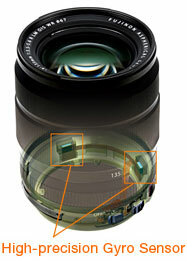 In order to improve the feel when adjusting zoom, a ventilator is placed inside the bottom of the lens barrel. The structure effectively prevents dust particles and moisture from getting into the lens. 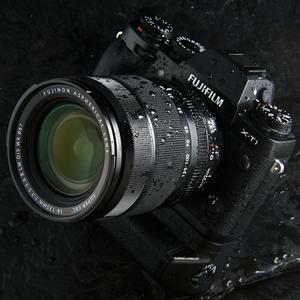 Use the XF18-135mm lens with the mirrorless FUJIFILM X-T1 compact system camera for a premium weather resistant kit. Add the VG-XT1 dedicated vertical grip for added versatility. Wide shooting range, image stabilization function and weather resistant structure in a zoom lens that weighs only 17.3 oz. (490g). When combined with the FUJIFILM X-T1, the weight is just 32.8 oz. (930g) and will allow you to expand the scope of your photographic activities and locations so you can capture any moment. Four aspherical lenses, each of which deliver the performance of multiple general spherical lenses together, are used to achieve extremely short optical length. This results in a more compact size and good balance to the lens, which makes it easier to shoot for long periods and awkward situations.